Which St Kitts heritage sites and attractions should I visit is a question that prospective visitors to St Kitts ask me all of the time. While this is a pretty straightforward question, I sometimes have difficulty in answering, because the islands of St. Kitts and Nevis have so many attractions and heritage sites with over 250 documented on St. Kitts alone. 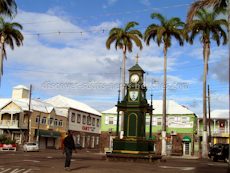 The capital city, Basseterre St Kitts is referred to as the historic town of Basseterre. Not all of the St Kitts heritage sites have been developed as tourist attractions, but for those that have been developed, they are definitely worth a visit. 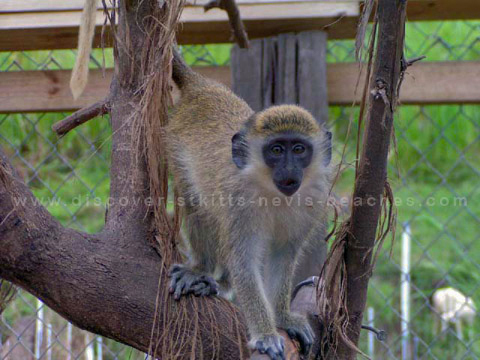 In what follows below, I will introduce you to some of the more popular St Kitts heritage sites and attractions. A visit to these St Kitts attractions is considered among the favourite things to do on St Kitts by many visitors to the island. In fact, most of the St Kitts tours and shore excursions offered by the local taxi and tour operators either drive by or include stops at the St Kitts historical sites listed below and in part two of the article. There is so much information that I can share with you about the heritage sites in St Kitts, however for simplicity, I have chosen to break this information down into two article series. In the first article series I will focus on the heritage sites and attractions located in Basseterre St Kitts, while in second article series, I will zero in on those historical sites located outside of Basseterre. The historic Old Treasury Building / National Museum Building was constructed in the 1890’s by the contracting firm of Gould Brothers out of Barbados. It is built entirely of andesite, the local volcanic rock, from which the stones were hand cut, and decorated with cream limestone from Barbados. The foundation stone which is located on the southern side of the building was laid by Lady Haynes-Smith, the wife of the then Governor Sir William Haynes-Smith on the 21st of March 1894. The building was constructed with an archway which formed an entry portal into the town of Basseterre for passengers landing by ship on the pier which used to lie directly in front of the building. The dome at the central top served as a lighthouse for many years to the hundreds of captains of the boats and ships that docked at the wooden Treasury landing pier over the Caribbean Sea. The building has been witness to the procession of life in and out of the nation’s capital for over one hundred (100) years. During the years when travelling by sea was the only option, the Old Treasury Building was given the name “The Gateway to the Island”. Today the wooden pier has been replaced by an apron from which you can see Port Zante, the new gateway into Basseterre, at which cruise ships dock. This historic building is one of the first St Kitts heritage sites that cruise ship visitors will see upon arriving at Port Zante. The Old Treasury Building presently houses the St. Christopher National Trust, previously known as the St. Christopher Heritage Society and the National Museum, as a constant gesture to its importance throughout its life on St. Kitts. The building is truly a symbol of Kittitian culture and history and embodies the philosophy of Kittitian heritage conservation; embracing the past while facing the future. 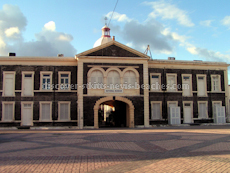 Today the archway of the Old Treasury Building / National Museum Building is considered to be the gateway to Historic Basseterre. 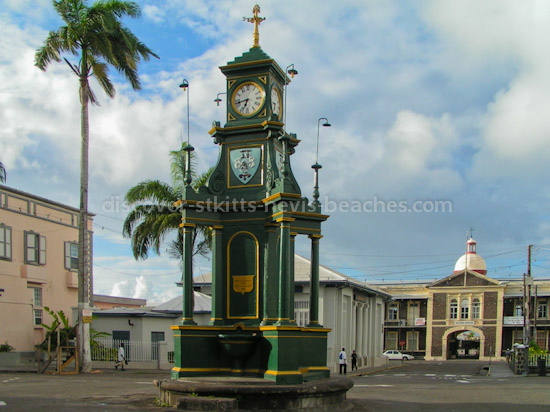 This St Kitts heritage site built in the form of a clock and drinking fountain is one of the iconic sights which immediately identifies its location as Basseterre, St Kitts. It stands in what is known as the ‘Circus’. 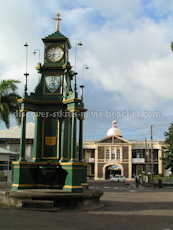 The Circus, said to have been modelled on Piccadilly Circus in the UK is in the center and heart of the main commercial area of Historic Basseterre. Four main city streets point from the memorial in the very center of the Circus towards the compass points, which themselves lead into the rest of Basseterre. Most of the banks in St. Kitts either lie on the circumference of the Circus or just beyond it. The memorial which was built in Glasgow has seen Basseterre change during its life time and itself has undergone changes; once a rich brick red it is now an environmentally correct green! 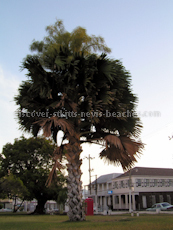 It was surrounded by majestic Royal Palms which were planted around its circumference. Over time these palms were destroyed by hurricanes and have just been recently replanted. The clock was erected in 1883 in honour of Thomas Berkeley a past legislator and estate owner. It was dedicated by Lord Combermere, a descendant of the first Lord Combermere who assisted the Duke of Wellington at Waterloo. memorial is one of the most photographed St Kitts attractions that is located in Basseterre. The 100th birthday of the Berkley Memorial was celebrated in 1983, the same year that St. Kitts gained its Independence. 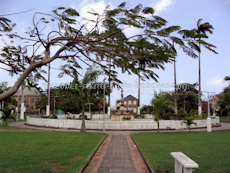 Independence Square is located slightly to the east of the present center of Basseterre. Built on lands bought for that purpose in 1750’s, its layout was designed to look like a Union Jack (check Google Earth to see this) and the streets and houses surrounding it were dated to that time period. In 1857 a stone fountain was built in the centre of the square. The pipe borne water in it came from Olivees Mountain. At the summit of the fountain there are three Grecian styled semi clothed ladies and a small male child who carries a fish. One lady has a conch shell and there is a turtle at their feet. Surrounding the circumference of the fountain are lovely flowering plants. The fountain, like many of the buildings surrounding the square has endured its own share of damage, but thanks to the efforts of many civic minded and heritage conscious individuals, businesses and NGOs, the damage to the fountain has been repaired. In 1834, the year of emancipation, the Square was described as “the market place of the Negroes where they assemble to gossip and quarrel and dispose of their stock… It is the place where the militia occasionally parade…” (The West India Sketch Book, 1834, p.6). Another publication described the Square as a “beautiful public garden or plaza embowered in tropical vegetation, and shaded at one end by a magnificent banyan tree…” (Williams. 1898, p.60) Unfortunately, time and environmental damage from hurricanes have destroyed many of the larger, older trees in the square. These have been replaced with ficus, (Ficus Plantae) and frangipani and other species. 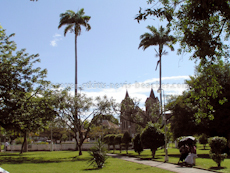 One of the most interesting trees which had been planted, was a large Talipot Palm near the north-west corner, and which flowered in 2006. These palms native to Sri Lanka grow slowly and live for 30 to 60 years flowering once in their lifetimes before dying. Their blades may be up to 16 ft across and they possess the largest compound inflorescence, or flower head, in the plant kingdom. Once they have flowered, round dark-green fruits fall by the thousands when ripe and then the tree dies. 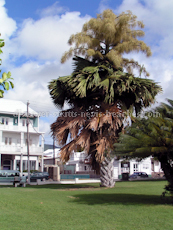 Although not much is known about its early life of the Square, what is known however is that it has always been a place in Basseterre St Kitts with beautiful and often unusual trees. Many adults and children, residents and tourists alike have spent leisure time relaxing on the benches in the Square or enjoying one of the cultural events hosted there. 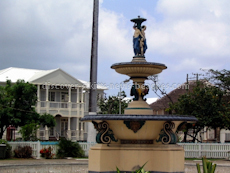 The Square was originally named Pall Mall Square, but was renamed Independence Square to commemorate the birth of St. Kitts as the newest nation to join the United Nations on September 19, 1983. I hope you have enjoyed part one of this St Kitts heritage sites article which featured three of the historical sites and attractions in Basseterre, St Kitts. Continue to part two of the article about St Kitts heritage sites located in Basseterre. Stay tuned for our article series about the St Kitts heritage sites located outside of Basseterre. If you appreciate the information shared in the these articles, please share your comments below; I'd definitely like to hear from you.